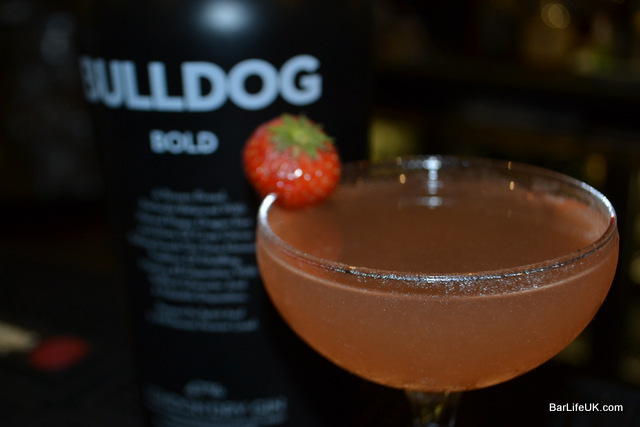 OnLocation was joined once again by Bulldog Bold Gin to make its way south to the seaside town of Bournemouth to see what this emerging cocktail town has to offer. Over the past few months OnLocation has seen us visit the likes of Manchester, Bristol, Edinburgh, Brighton and Leeds, all towns with a strong bar heritage and scenes BarLifeUK are very familiar with. Bournemouth was a new experience with a host of bars and bartenders we had never seen to explore. In a suburb of Bournemouth known as Christchurch on the River Stour sits the Captains Club Hotel and Spa. The building lives up to the nautical theme with porthole style windows on either side of the entrance. The bar itself looks out across the river with fancy looking yachts moored up alongside. 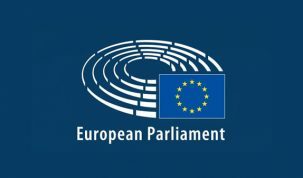 The interior has a bit of a posh golf club feel to it with big sofas and armchairs to relax in whilst you play the ‘if I won the lottery which yacht would I buy’ game. 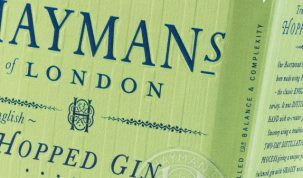 Muddle the apple, jam and rosemary together before adding other ingredients and shaking. Spray a coupette with the peach liqueur and fine strain in the cocktail. Garnish with a whole fresh strawberry. Summary: It’s a bit of a taxi ride from the centre of Bournemouth but provides a fantastic place to while away a sunny Sunday afternoon down by the water whilst being looked after by the bar team. 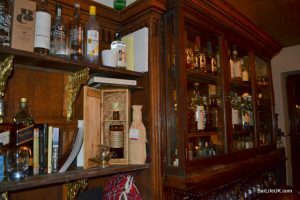 A new addition to the Bournemouth bar scene is the Library Bar which is located above a well-known restaurant, The Larder House. 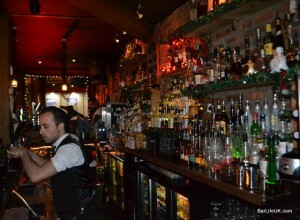 The Larder House bar was originally set up by Bournemouth alumni Jon Lister and Bournemouth heavyweight James Fowler. Whilst Jon headed for the bright lights of London James has stayed in Bournemouth and opened the Library Bar. This small bar would not look out of place in any of the world’s great cocktail cities. It has a very colonial library feel full of dark wood, stuffed animals, wooden globes and of course plenty of books. The shelves around the room also contain half of the bars spirit stock, customers are encouraged to have a look and if they want to try any, the staff ask them to pass the bottle over. This helps to give the bar a very informal atmosphere and get the customers involved. 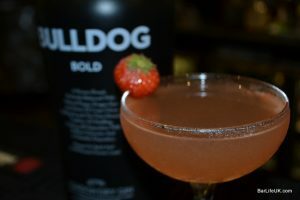 The drink serves are equally as unusual and inclusive, whilst James and fellow bartender Joel had a play with the Bulldog Bold we tried out a couple of their house cocktails. The Young Buck (Appleton VX, Domaine De Canton, Amaro, lime juice, egg white and ginger beer) is served in a wooden car alongside a taster of Appleton 21 year old. The Jalisco Disco (Tapatio Reposado, Martini Rosso, Campari, pink grapefruit juice and absinthe) is served with Tequila by Terrovision blaring out of an iPod whist disco lights dance next to the cocktail. Built in a hi-ball over cubed ice and garnished with a grapefruit twist. 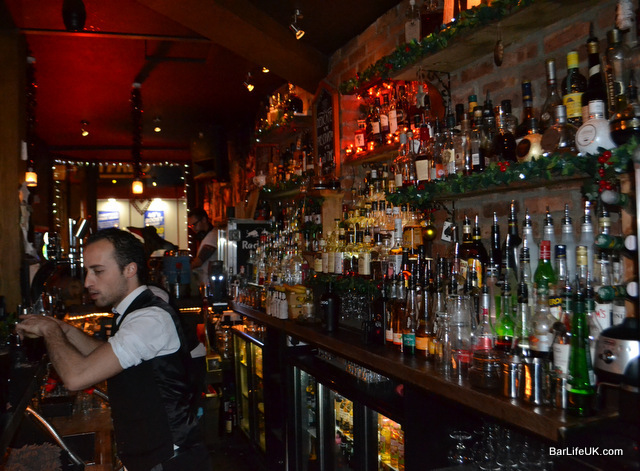 Summary: One of the best new bars BarLifeUK has been to this year. Sit at the bar and chat to the guys, grab a nice big glass of something dark, a cigar and head out onto the large smoking terrace or grab a table and ask them about their Globe serves. Whichever you choose you’ll be a happy puppy or perhaps settle in and try all three (open Thursday – Sunday). Urban Beach’s bar was originally set up by the aforementioned James and Jon however the venue has a slight gastro pub feel to it. The large outside area is, we’re sure, very popular in the summer but it was a bit of a chilly night for us. Inside, the bar whilst small and a little hidden at the back corner of the large room, was well stocked. The cocktail menu focused on the classics but the blackboards contained plenty of seasonal specialities focusing around winter warmers such as spiced ciders, hot toddy’s and mulled wines. It was however the bars own beer that caught our eye, an IPA by the team at Bath Ales superbly entitled ‘YIPPEE-KI-ALE’ served by our great bartender Michelle. Summary: A venue that we are sure comes into its own in the summer but even in the depths of winter the warm feel of the venue and the blankets provided to anyone brave enough for the outdoors certainly cry out for a sample of the warming specials. Located on the other side of town in the Westbourne area Eau De Vie is a couple of years old and renowned as one of Bournemouth’s best cocktail bars. The front of the venue contains the restaurant seating however once the bar is reached you immediately feel inspired to order a cocktail. The bars funky décor (if a little over lite) is complimented by tables made from wooden barrels and a poster on the wall announcing ‘The bar is closed when we play Purple Rain’. The bar is obviously very proud of their bar team with their nicknames proudly displayed on the wall which encourages immediate interaction with the folks behind the stick. Shaken, fine strained into a coupette and garnished with a grapefruit zest. Summary: The atmosphere and staff at Eau De Vie immediately make you feel at home and it is surely a great place to spend a couple of hours with some mates or on your own chatting to the bartenders. We didn’t eat there but the food certainly looked and smelt fantastic so if the drinks really start to flow you won’t have far to go to refuel. Aruba is a large cavernous venue on stilts overlooking the Bournemouth beach and sea. The venue, partly due to its size, has a nightclub feel at night. We didn’t get to see it during the day but the view from the large deck is presumably a large draw. The bar itself had a strong cocktail focus, however due to the style of venue at night the drinks we had came in plastic glasses. The bartender Jody was certainly enthusiastic and knocked up our drinks with plenty of speed. Summary: Aruba is a venue we would very much like to visit again during the day and not during office Christmas party season. The cocktail list suggests that good drinks overlooking the sea during the day is its speciality. 1812 is one of the original bars in Bournemouth and has had many of the towns top bartenders shake their stuff behind the thick wooden bar. It was also located in our hotel so we had enjoyed a gin and tonic there earlier in the day whilst planning our route for the night. Despite the late hour and the fact they were presumably more interested in closing the bar the bartenders were fantastic value. Whilst they knocked up some drinks for us they kept us entertained with banter and stories. The room itself is very much a hotel bar with a huge back bar dominating the room. Elsewhere booths give it a cosy feel and the barrels on display a nod to the cocktail bent of the bar itself. Despite the traditional seaside feel of the hotel the drinks that came out certainly showed the bar is a step above the standard. 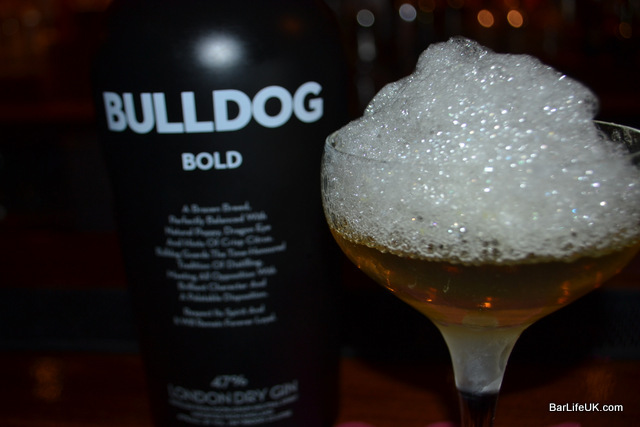 Josh Mitchell showed us his skills by producing a Bulldog Bold cocktail topped with a Green Tea Foam and served up with a great name. Shake all ingredients and fine strain into coupette. Top with foam. Summary: As with so many bars it is the staff that make 1812 a venue to visit so make the most of them and sit at the bar rather than in one of the comfy looking booths. This long standing venue is certainly worth a visit even if the décor isn’t to your taste. Our last bar for the night was also our first standalone bar. This is the venue that bartenders head too when their shift has finished and has an atmosphere that reminded us of Mojo or Trailer Happiness. This is the closest Bournemouth has to a dive bar with exposed brick work, dark red seating and a hugely impressive back bar with a big whisk(e)y focus. The music was good rock that had people dancing in any spare bit of space, leading to some fun elbow dodging in between the door and the bar. The bartenders seemed to be having as much fun as the customers whilst still banging out the drinks which looked to be a heady mix of cocktails, shots and beers. On route to Smokin Aces we had wandered past a nightclub that had a huge queue of students and local kids, thankfully places like that exist to ensure an eclectic crowd can enjoy this type of venue. Muddle the berries and wedges before adding the rest of the ingredients and dry, then wet shaking. Fine strain into a coupette glass and garnish with Angostura Bitters and a cape gooseberry. Summary: This is a fantastic bar to end the night in, it is also exactly the type of bar that will make sure you regret it when you wake up the next morning. 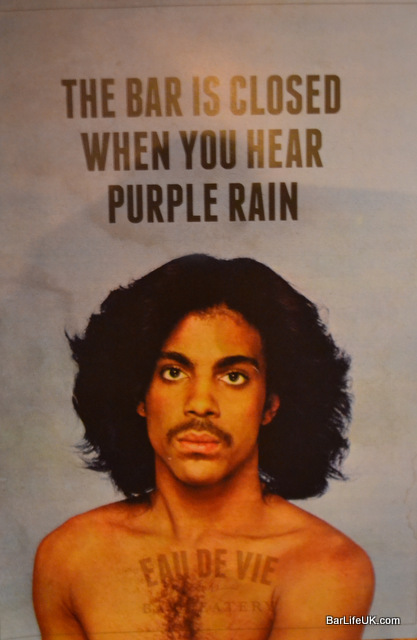 The drinks were free flowing, the crowd were having a ball and you feel like you are never going to leave. The staff, from the guys behind the bar to the bouncer on the door also make you feel very at home no matter what you order. We didn’t know what to expect when we got off the train however Bournemouth was a real treat. Whilst most of the bars are attached to hotels and restaurants they seem to have their own personality which comes predominately from a very enthusiastic bartending crowd. The drinks on the whole may have been a little on the sweet side but that is very much to do with the customers tastes and no doubt as these bars and bartenders continue to improve and grow so will the tastes of the punters. With a monthly get together and internal competition being organised by the more senior guys we foresee great things for Bournemouth and look forward to watching it evolve in the months and years to come. OnLocation with Bulldog Bold will be back in 2014 with Birmingham, Liverpool and Glasgow next on the hit list.